What does GLU stand for? What does GLU mean? 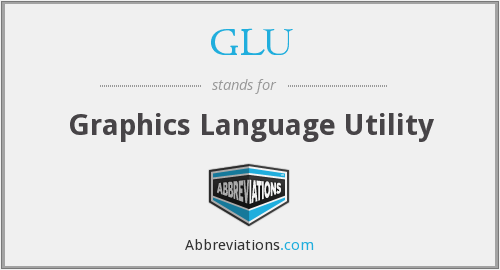 This page is about the various possible meanings of the acronym, abbreviation, shorthand or slang term: GLU. Glu is a leading global publisher of mobile games. Its portfolio of top-rated games includes original titles Super K.O. Boxing!, Stranded and the Ancient Empires franchise, and titles based on major brands from Atari, Harrah's, Hasbro, Microsoft, PlayFirst, PopCap Games, SEGA and Sony. Founded in 2001, Glu is based in San Mateo, California and has offices in London, Hong Kong, France, Germany and Brazil. Consumers can find high quality, fresh entertainment created exclusively for their mobile phones wherever they see the 'g' character logo or at www.glu.com. Couldn't find the full form or full meaning of GLU? Know what is GLU? Got another good explanation for GLU? Don't keep it to yourself! "GLU." Abbreviations.com. STANDS4 LLC, 2019. Web. 22 Apr. 2019. <https://www.abbreviations.com/GLU>.